John Battelle summed up Google’s access to people’s wants and desires very well in his book The Search which I reviewed in 2006. His premise was that Google’s ability to access big data analysis of all our desires puts it in a unique position. Of course the term “big data” wasn’t used back then but you get the idea. A recent Wall Street Journal article sheds light on how Google’s access to the desires of its users can turn it into a predictor of macroeconomic trends such as a recession. Moreover, using Google Trends, anyone can have access to this information. It’s worth pointing out that Google Trends delays the data it makes available meaning Google has access to fresher data than anyone else. The details are housed in a report titled: Predicting Recessions in Real-Time: Mining Google Trends and Electronic Payments Data for Clues from the C.D. Howe Institute. According to the report, terms like recession and jobs can be searched on to determine people who have lost jobs and are concerned about economic direction. The report discusses how Google has been used in the past to predict housing price direction as well as accurate labor market forecasts. There are many charts in the report – this one showing how the increase in searches for the term “jobs” seems to nicely predict an increase in Canadian unemployment rate is most illustrative of what the researchers are trying to prove. 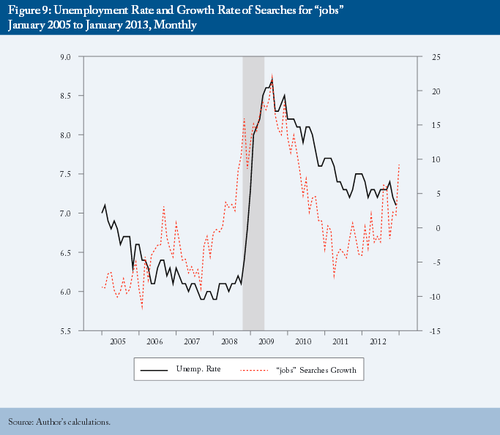 See how the red line corresponding to Google searches for jobs leads the black line which represents the unemployment rate. Big data has tremendous potential to change business models, improve customer targeting and allow companies to generate more revenue from their data. The research report highlighted here gives us an idea of how data in a search engine can more accurately predict major financial events such as recessions with minimal effort. It further shows us that economists may be looking at old data when trying to predict the direction of the economy. Finally, it illustrates that Google could use this data in many ways which would give it tremendous advantage over any other company. For example it could embark on mergers just as markets seem to be slowing in order to get a better price. It could further short stock market indexes as it sees negative sentiment indicators. It will be worth watching if regulators start to factor Google Trends data into their forecasts and whether government officials become concerned about one company having access to such pivotal information.